This class of locomotive was introduced in 1903 by the Great Western Railway. hey were designed by George Churchwood & built at Swindon. For over 50 years they were the mainstay of heavy freight haulage in South Wales & the South of England. Altogether 167 locomotives of this class were built. In South Wales they worked chiefly on heavy coal & steel trains along the main line between Llanelli & the Severn Tunnel although a batch were based at Aberdare to work coal trains across Pontypool Road. The prototype of the '2800' class, number 97, was the first locomotive to operate in Britain with this wheel arrangement. It was fitted with the Standard number 1 boiler working at 200 p.s.i. & cylinders of 18 inches diameter. In order to allow some flexibility over the 16 feet 10 inch wheelbase, the tyres on the second & third pair of driving wheels used thinner flanges & the front pair of coupling rods were fitted with spherical joints in order to permit a small amount of side play. It was renumbered 2800 in 1906. 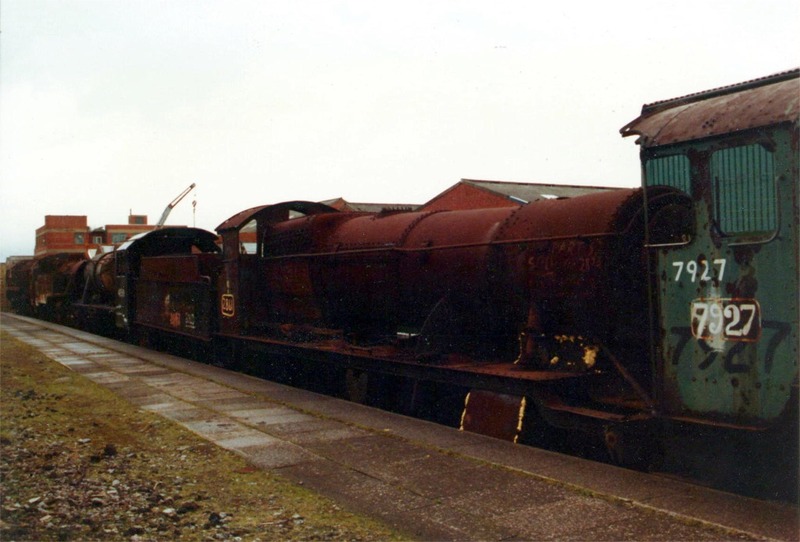 The first production batch of 20 engines had the smokebox saddle raised more than the prototype so that the boiler pitch was raised by 8½ inches (as shown by the amount of daylight visible under the boiler). This batch also introduced 225 p.s.i. boiler pressure to the class. The second batch of 10 engines were identical except that the cylinders were bored out to 18.375 inches, which was altered again when superheating was introduced to 18½ inches. The designed load for the class was 60 wagons. A test train comprising of engine no. 2806, a dynamometer car & 54 wagons began trials with the load progressively increased until 100 wagons were hauled. This became the standard loading for the class. With additions of windowed cabs, a casing for the fire irons & outside steam pipes fitted as standard, the last batch ( 2884 - 2899 & 3800 - 3866 ) brought the total number of the class to 167. This later batches were known as the '2884' to highlight the differences from the earlier locomotives. To strengthen the front frame overhang, support struts were fitted between the smokebox saddle & the front end of the frame to all members of the class from 1908. As with most GWR locomotives, superheating was added in 1909, firstly to number 2808 whilst top feed was fitted as standard from number 2836 in 1912 with previous engines being so modified. Meanwhile the front frame was altered to the familiar curved shape in 1911 from number 2831 & again previous members were modified later. The shape of the curved frame was not as great as the type fitted to the 'Saint' class for example, since the size of the driving wheels gave a low height running plate. The last modification to the class was the use of outside steam pipes together with a new pattern of cylinder block introduced in 1934. The first of the 2800 class to be withdrawn was the prototype, number 2800 in April 1958 after travelling 1,319,831 miles, whereas the last engine in service until November 1965 was number 3836. 16 engines of the class have been preserved & they are numbers 2807, 2818, 2857, 2859, 2861, 2873, 2874, 2885, 3802, 3803, 3814, 3822, 3845, 3850, 3855 & 3862. Running numbers: 2800 - 2899, 3800 - 3866. Built: 1903 (2800), 1905 (2801 - 2820), 1907 (2821 - 2830), 1911-1913 (2831 - 2855), 1918-1919 (2856 - 2883), 1938-1942 (2884 - 2899, 3800 - 3866). 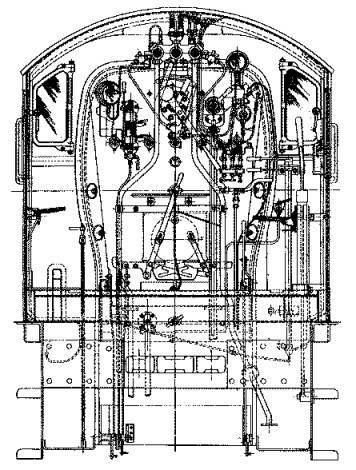 Technical drawing of the cab of a 2800 class locomotive.